A must-have if you plan on repairing or recoloring a large area or if you are just recoloring. Removes ink stains too! Stronger cleaner than our alcohol towels. 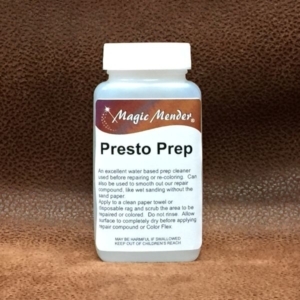 Presto Prep cleaner safely removes any previous conditioners as well as body oils and dirt. It actually slightly softens the surface, allowing our Color Flex to adhere properly. Will remove ink stains too! Stronger cleaner than our alcohol towels. Saturate a paper towel with Presto Prep cleaner and scrub the surface. You can use a scrunge pad if you’d like. Wipe off excess and allow surface to dry before applying repair compound or Color Flex. For ink stains, saturate a cotton ball and lightly wipe the area in a circular pattern to wet the surface, then just set the saturated cotton ball on the stain for about 15 minutes to allow the Presto Prep to loosen and soften the ink. After 15 minutes, saturate a new cotton ball and gently dab the now liquefied ink. Change the cotton ball as it gets dirty so that you’re not just blotting the same ink into the surface. Repeat this process until all ink is removed. Presto Prep will also remove any previously applied conditioners and may leave the surface looking milky or whitish. That’s easily remedied by applying conditioner to the area.